I keep meaning to get back to regular posting, but 4-month old babies keep you surprisingly busy. ;) There's not much time for cooking, much less writing blog posts! Luckily this pork shoulder has minimal hands-on time and will feed a small army. You prep it the night before you want to eat and just stick it in the oven the next morning. Place the onions and oranges on the bottom of a roasting pan. 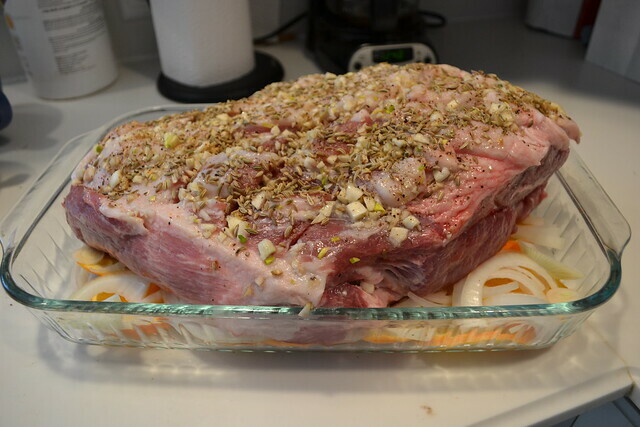 Score the fat side of the pork in a diamond pattern and place it on top of the onions/oranges. Rub the garlic and fennel into the pork and season with salt and pepper. Cover and marinate overnight in the fridge. The next day, uncover and roast at 275 degrees for 7-8 hours. The pork will be almost meltingly tender and the fat nice and crispy. You can serve it right away with the juices from the pan. Leftovers firm up in the fridge and are great browned in a skillet with a little lard. Put it in lettuce wraps with pickled hot peppers and olives. Or you can add some cumin when reheating and use the meat for taco salad along with your favorite toppings. Leftovers are also great in hash. It's very versatile! First, thanks so much for sharing this on chowstalker! And 2nd, thanks for sharing this because it sounds delicious and I have a couple of rather expensive pastured pork shoulders in the freezer that I was trying to figure out how to prepare. You have some great photos and recipes so I hope you will share more...in between diapers and such! Patty, I hope if you make the pork shoulder it turns out for you! I love your chowstalker idea and hope to be able to share more stuff on it. :) I found it from the MDA boards if you were curious. Made it last night...delicious!!! I love the combination of the orange and fennel. I will try to incorporate that into many more pork recipes! Looks delicious! How long would you recommend cooking this in a slow cooker for? On low for 8 hours?? Thanks for posting this. I just made it last night and it turned out wonderful! This looks great. I also do a pork shoulder where I grind a 2" piece of fresh ginger, 10 cloves of garlic, 1T olive oil and some kosher salt in the processor. This makes a nice paste. I start the shoulder on 450 degrees for 30 minutes and then smear on the paste and reduce heat to 300 for about 4 hours (or more). Never fails to please. I spose you can leave out the salt depending on your version of paleo. 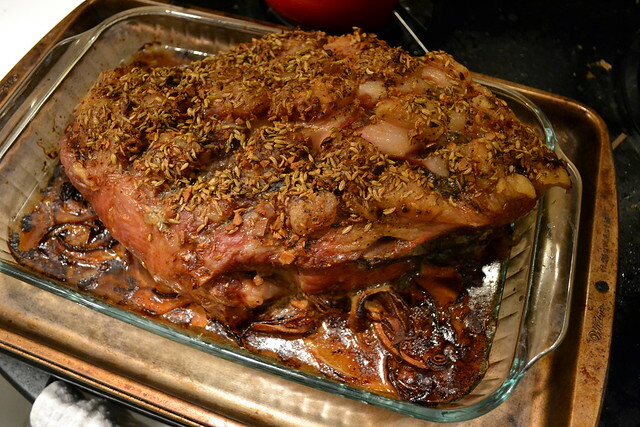 The pork can be almost meltingly sensitive as well as the extra fat wonderful and crispy. You can serve it best suited apart using the juices by means of the pan. Leftovers organization up within of the refrigerator and therefore are amazing browned within a skillet using only a tiny lard. When we play the WOW Gold, we need to try Runescape Gold and spend less money, do we have any good way to Buy Runescape Gold from trust friends? We need to we can play the game becomes more easy and update the levels quickly. This is a very interesting blog and so i like Cheap RS Gold and visit your blog again and again. Keep it up.Enjoy when you can, and endure when you must. it ls a good article and love your words , so charming and make people learn a lot wow gold buying, thanks !come to my site wow gold buy for more cool games gold. To obtain gold wonderful has been a arguable problem withWOW Gold or WoW gamers. Possibly the largest Mmog on a global scale, Wow comes with an far more than one million paying users in North America on your personal. Cheap WOW Gold is Globe of Warcraft s unit of foreign currency.In spite of the fact that you’ll find coaching sites to show players the methods of earning completely cost-free WOW Gold for sale, a majority would rather get gold wonderful to advance their very own virtual status in the game. Patty, I hope that if you make pork shoulder originally for you! I love you chowstalker of ideas and hope to share more things in it. :) I found it from the MDA board if you are curious.